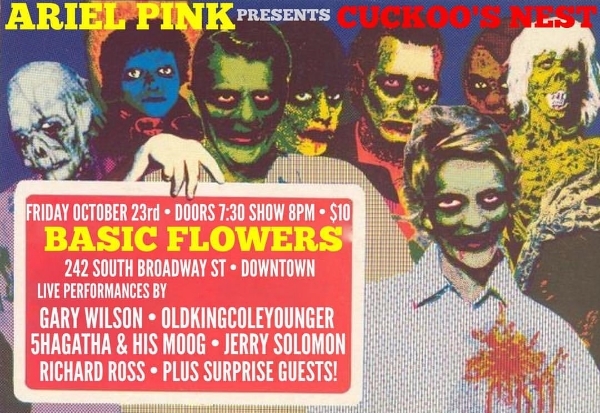 It's been a busy week preparing for tonight's Gary Wilson show in Tijuana, so I'm just now getting around to posting about last weekend's incredible event in downtown L.A., Ariel Pink presents Cuckoo's Nest. The evening took place at Basic Flowers, and here's the short version: this type of thing is as good as it gets. It's why I do music, and an example of curation at its finest. I'm including a video here of just some of the evening's highlights. Since I was playing with Gary Wilson and the Blind Dates, I was unable to capture all the evening's footage. Unfortunately, I missed Ariel performing with Don Bolles as I was getting into my tights and makeup (what's a Blind Date to do? ), but I was happy I was able to document snippets of brilliant performances by 5hagatha, Richard Ross, Jerry Solomon, and Old King Cole Younger. The solo "5hagatha and His Moog" performance was especially appealing to me since the instrument has always held a special place in my heart (via "the Beach Boys Love You" album, as well as the band the Moog Cookbook), and 5hags did the instrument justice, with seemingly inexhaustible access to ideas and sounds through the small instrument. I was unfamiliar with Jerry Solomon, but word on the street is that he was cited by Andy Kaufman as an influence. I've included a video here of some of his performance. During Mr. Solomon's time on the mic, and indeed throughout the entire evening, the crowd was 100% present, appreciative, and engaged. Ariel was running sound and hopping on the mic intermittently, the distinction between the artists and spectators was next to nil, and I was struck by the sense of genuine community. I had just enough time to get out my Blind Dates garb and makeup in order to enjoy the final set of the evening, contributed by Old King Cole Younger. The set rounded out a strikingly diverse - and yet equally complementary - evening of creativity. The word "curation" sounds stuffy to me, but that is exactly what Ariel Pink did so beautifully on this evening, and has consistently done throughout his career. Besides his own brilliant music, he's been instrumental in bringing the music of brilliant artists like R. Steve Moore (e.g. Ariel's Picks, Vol. 1 - a fantastic and thoughtful compilation of the Father of Lo-Fi's music), and, of course, Gary Wilson. And speaking of Gary, although I was playing drums and unable to film, here's a recent Gary Wilson and the Blind Dates performance for you to enjoy. Thanks to everyone who made Ariel Pink presents Cuckoo's Nest so special, and as always -- thanks for staying tuned in!